On day three, we left Banff headed for Lake Louise for two nights. Originally we were supposed to spend two nights at a B&B in Field, BC – but when we contacted them the day before they wrote back after a long delay – stating that they had written down the wrong dates and we had no accommodations there for the nights we had planned. So we got online and found Post Hotel had some openings, and it was located in Lake Louise – which was not far from the things we had planned to see. 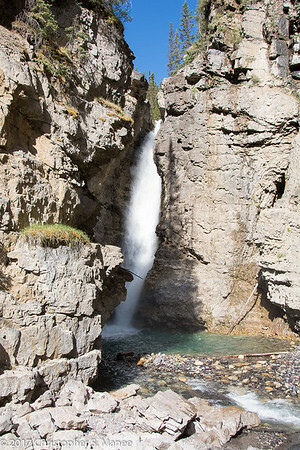 Before we left we grabbed some things and headed up to our first destination, which was recommended by the B&B hostess from where we had just departed in Banff: Johnston Falls, located in Johnston Canyon. She recommended taking the Hwy 1A, which paralleled the Trans-Canadian Highway, as it was a more scenic drive, so we pulled off the main highway and set off winding towards the canyon. Once we got there we found that the lots were full, and we just parked along the gravel on the side of the road and walked in. It quickly became obvious that this was a very popular destination: lots of cars and naturally an unfortunate number of charter buses. We weaved our way along Johnston Creek towards the upper falls. It was an okay hike, maybe 2.5 km but it took forever because you were behind lollygaggers and people that didn’t pay attention to anyone around them and blocked the often very narrow walkway. Eventually, we arrived. As you can see, it was one of the sunniest, and probably most clear days we had during our trip. On our second day of our Canadian Rockies adventure (did you miss Day 1?) we woke up to a cool morning as we departed Radium Hot Springs for the entrance to the first park: Kootenay National Park (official) (Wikipedia). The weather so far wasn’t unlike what Seattle had experienced this summer: warm, dry days and cool, refreshing nights. After a tasty breakfast at the motel, we hit the road for the park entrance – it was less than a kilometer away. 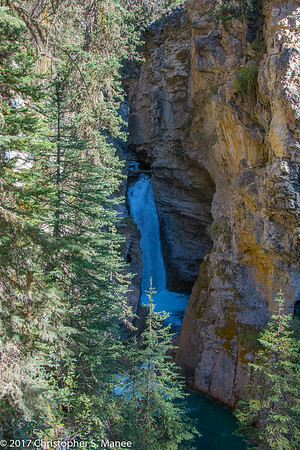 The actual entrance to the park was unique in that it went through a canyon – Sinclair Canyon, to be exact – on its way to a valley where you could see cool alpine rivers and sweeping views of the valley and its bordering mountains.